If you want to make the right impression with consumers, having a sleek, modern website is a must. The minimalist look is a huge trend and one that all businesses need to consider—gone are the days of chaotic layouts and garish designs, because if you want to capture the attention of your potential audience you need to keep it clean, sleek and subtle whilst giving them the information they need. 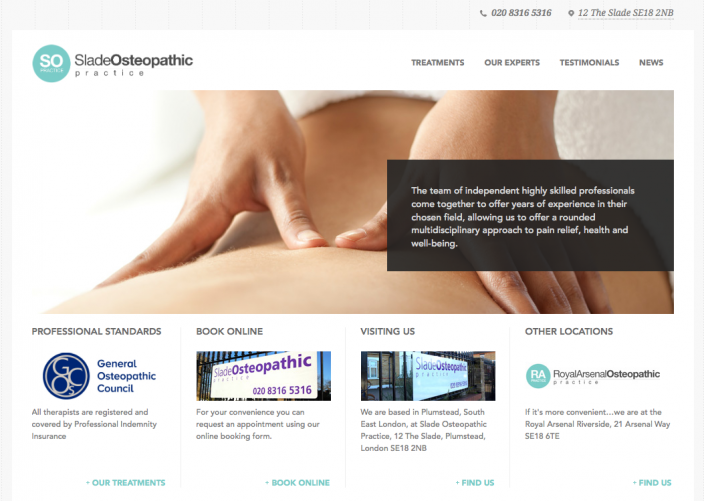 Here at Juno we understand that fact, and that’s why we’ve given Slade Osteopathic Practice a beautiful sleek new look. Slade Osteopathic is a London-based clinic that provides osteopathic treatment tailored to the needs of the individual, as well as offering a range of other holistic treatments including the likes of acupuncture, remedial massage and exercise rehabilitation for a targeted, personal and highly complementary treatment plant. This is a clinic that’s dedicated to the care and wellbeing of patients, taking a holistic yet professional approach, and we wanted to reflect those core values in our design. We think we’ve managed to achieve it. We knew we needed to create a site that was sleek, stylish, professional yet friendly, offering all the necessary information in an easy-to-see format to complement the relaxed, holistic feel of the practice. We’ve taken a highly minimalist approach to the design process to keep things as clean and simple as possible—the sliding banner on the homepage delivers the necessary information with the addition of eye-catching images whilst the simple layout ensures information is easily accessible, and contact details are clearly displayed throughout the site. The navigation is simple, the colour scheme clean and understated, the images effective and the whole thing manages to work together effortlessly, and having a WordPress foundation makes it usable for the client too. We’re proud of the sleek new look we’ve been able to give Slade, so if you’re longing for the minimalist look too make sure to get in touch and see what we can put together.